What do you do when you have a glut of drumsticks? Make drumstick curry with mustard or any other spice blend. Or make drumstick flower pakodas. The regulars at Banaras ka Khana know that I have a giant tree of drumsticks in my front garden, they are bursting with their best flavors right now and the sight of those branches heavy with drumsticks are forcing me to pluck them even if I can't consume them all. It gets distributed to neighbors. Needless to say, I have been using the drumstick flowers and the pods of drumsticks for different types of curries considering it is so healthy. I see that this fruit (vegetable for us) is a favorite of parakeets. Large flocks of beautiful parrots come to the tree every evening, perch just above the fruit, bow down and peck their beaks into the fruit to eat the flesh. When the fruit will be mature and seeds will develop inside, the parrots beautifully slide down the drumsticks to pick the seeds from the splitting pods. I can spend hours watching them doing this. Parakeets use their feet just like we humans use our hands. Earlier I have seen parrots perching on mature sunflowers in my garden to pick the seeds to snack on. They know instinctively what is good for them indeed. I use drumsticks in sambar mostly as everyone else. 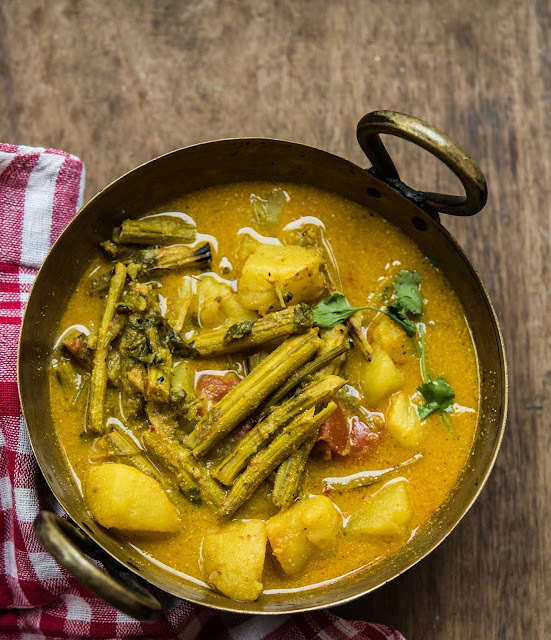 This mustard based drumstick curry is a traditional eastern UP preparation, served with plain boiled rice it becomes a satiating meal on its own. The kind of homely comfort meals we need when we come back from travels etc. This particular sehjan ki subzi is my grandmother's recipe but it is made with minor variations all over eastern UP and Bihar as well. The tender drumsticks are great for this curry as they cook quickly but the mature ones are considred better by many people as they pack in more flavour. 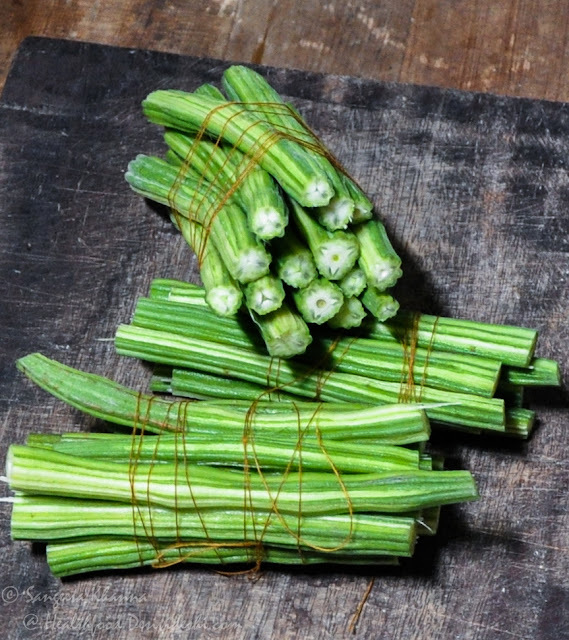 It is fun to chew the mature thick pieces of drumstick which are quite fibrous and hard, the flavourful flesh lies in the middle of the stick which has to be either scraped out or you chew the stick to eat the flesh and then discard the fiber. This mustard gravy makes the drumstick curry differently flavorful I must add. I do not peel the drumsticks if they are home grown or organic. Chopping them in about 2 inch long pieces is better for this curry. Making a bundle of the drumsticks is good if you want to retrieve them together in a curry or even in sambar. Heat oil in a thick base kadai and pop in the cumin seeds and wait till they splutter.. Throw in the potato wedges, stir fry for a couple of minutes and then add the drumstick pieces too, stir fry lightly till the potatoes are slightly brown n the drumsticks are glossy. Sprinkle the everyday curry powder, turmeric powder, salt and add the chopped tomatoes to it. Stir fry the mixture for a couple of minutes and then pour the mustard paste, add water to make a curry of desired consistency, and let it boil covered for about 10 minutes, the tomatoes get mushy, the potatoes soft and the drumsticks yield to pressure. Add the coriander greens, add some lemon juice if you like,cover and put off the flame and let it rest for a couple of minutes before serving. wow..........drumsticks curry looks yummmm...dear. and it's totally new thing to cook with mustard. happy holidays dear. Its new to meeeeee..Looks delicious and yummyyyyyy. Lucky u to be able to use such tender Drumsticks, wish I lived next door.... I did not know parrots enjoy eating them. I usually don't cook drumsticks but liked the way u cook it with mustard. This curry is Perfect with hot rice Sangeeta. and fresh from garden it must be tasting awesome! Thats a great dish indeed. We cook a similar dish (Cha-chaDi), but the other spice are different and no garlic onion. This taste will be great I am sure. I generally don't enjoy baby drumsticks instead I like the fat matured ones. This is a very unusual recipe and I am definitely going to try it! Thanks. A traditional Tamil recipe is to make a drumstick and brinjal vegetable with onions, tomatoes and sambhar powder.